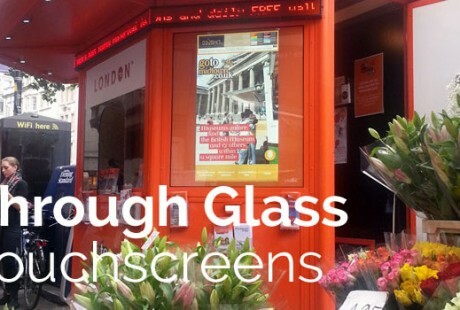 We are leaders in the design, sale, installation and support of through glass touchfilm solutions, combined with LED/LCD displays to create interactive shop windows or kiosks. An LED/LCD display is combined with a matching size interactive touch film to create interactive shop windows or large through glass touch screens. Touch films are carefully applied to single glazed clear glass to create interactive glass, like the example shown above. That example used a 42″ screen display in portrait mode with 42″ clear touchfilm applied to the glass. As the technology is installed on the inside of the glass, it is protected from rain, damage, vandalism, theft etc. Standard screen sizes are 24″, 32″, 42″, 46″, 55″, 65″ in 16:9 aspect ratio. We can make custom sizes or quote for special projects if required.. If you have a requirement for large through glass touch screens using touch films, touch foils, then please give our Technology Team a call for a quote on 0151 8080 180. We ship worldwide and accept card payments.